On a deeper therapeutic level, Cupping is very beneficial for many conditions such as high blood pressure, anxiety, fatigue, chronic headache, fibromyalgia and neuralgia. Contracted, congested muscle tissue will soften quickly with only a few minutes of Negative Pressure Massage Cupping. Used on the back, the larger cups will mimic the rolling action of myofascial release without discomfort to the client. The variety of movements can be long and draining, circular and vibrational for stimulatiion and for areas of stubborn knots and rigid tissue. The skin will redden with strong pressure, indicating that the circulation has been brought to the surface. Application of liniments, analgesics, tinctures, hydrosols and essential oils immediately post treatment will facilitate absorption of the product deeper into the tissue. The increased blood supply to the local muscles and skin will bring nourishment and stimulate the circulatory and lymphatic systems to carry away stagnation and toxins. Another benefit of negative pressure is that it really feels great, and is not an irritant to the skin or body. It draws the inflammation out, yet does not add to it. The pulling action engages the parasympathetic nervous system, thus allowing a deep relaxation to move through the entire body. It is not unusual to fall asleep when receiving this treatment. Clients are surprised at how relaxed, warm and light they feel – hours... sometimes even days afterwards. Almost any therapy can be enhanced by the addition of negative pressure. A wonderful ancient tool has found its place in the contemporary world of holistic care. Massage Cupping is a modern form of vacuum therapy, and the incredible results that this simple treatment produces have truly impressed those who experience its subtle power. 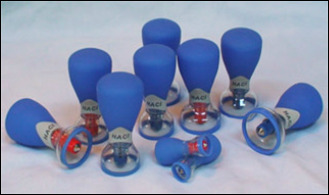 By creating suction and vacuum pressure, Massage Cupping is used to soften tight muscles and tone attachments, loosen adhesion's and lift connective tissue, bring hydration and blood flow to body tissues, move deep inflammation to the skin surface for release, and drain excess fluids and toxins by opening lymphatic pathways. Massage Cupping treatment is incredibly versatile and the basic movements can easily be customized to accomplish a wide variety of techniques, from lymphatic drainage to deep tissue release. This complements many body work modalities ranging from spa treatments and medical massage to chiropractic, physical and occupational therapies. Biomagnetic Field Therapy holds so many all encompassing, powerful effects that no one description of how they exert their positive therapeutic effects could adequately describe all the myriad and complex ways it effects mind and body.